The OMAHA was built in 1856 at Madison, Indiana. She was a sturdy and dependable boat that traveled the Missouri River for ten years. Her route was the 771 miles that stretched between St. Louis, Missouri and Sioux City, Iowa. 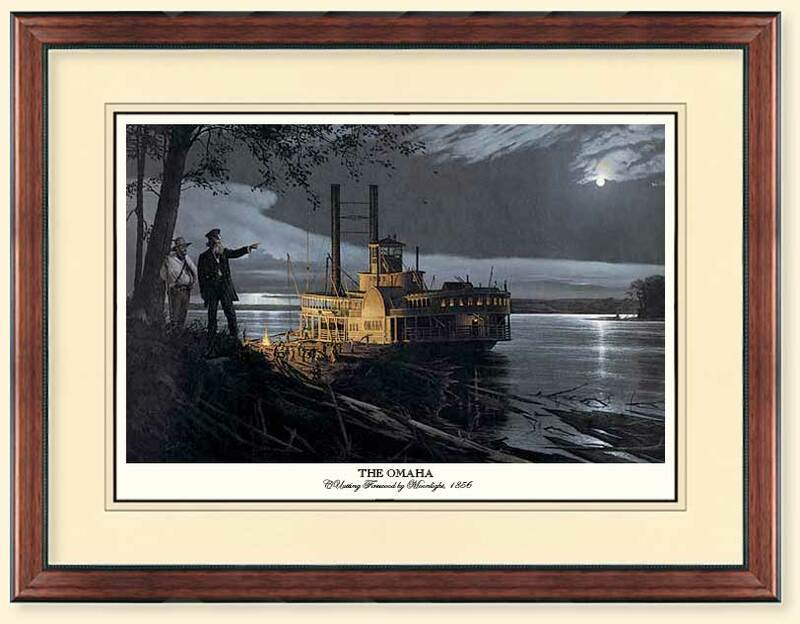 This painting depicts her 1856 voyage up the Missouri River. On that voyage to Sioux City, the OMAHA was carrying close to $70,000.00 in goods. This shipment of merchandise consisted of hardware, sawmills, and even prefabricated buildings - all the items necessary to build a new community. The firm of Tootle and Jackson commissioned the OMAHA to deliver these goods. Once the OMAHA arrived they could begin to build Sioux City. This settlement became an important staging area for future travels on the Missouri River to the Montana gold fields. 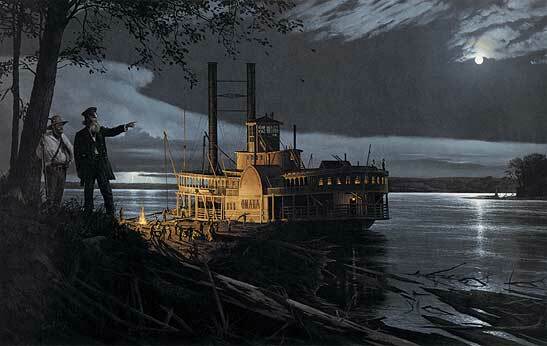 In this painting the OMAHA has stopped for the night. It was during this time the crew would cut firewood in order to replenish their supply. Steamboats possessed a ravenous appetite for firewood. It was not uncommon for the vessel to use between ten and twenty-five cords of wood a day. An essay on the history of the OMAHA, written by noted author John Madson, will accompany each print.